We have blogged previously here on “Know, Catch, Keep” that banks need to look to simplification to help grow their business. A recent KPMG survey shows this trend remains a top priority in the industry. That survey reflects the responses of 100 banking/ financial sector executives from large, U.S.-based companies with $100 million or more in annual revenue. Simplification helps improves operational processes, enhancing the bottom line in a time when banks are struggling for growth. In working with bank clients, we find that many have evolved over time to the point that many have multiple platforms involved in supporting product lines and channels. If you are wondering whether this applies to you, ask yourself the following question. When looking across your various product lines, do you have multiple platforms or solutions for one or more of the following? 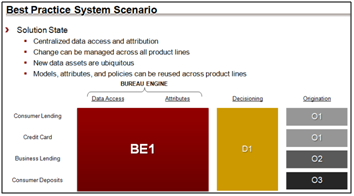 In the example above, the “before” scenario for this bank involves multiple technology platforms in use for data access, attribution, and decisioning (or rules processing). By working with this bank, Equifax was able to help them achieve a significant reduction in their overall complexity by consolidating seven different bureau access and attribute generation technologies into a single solution. 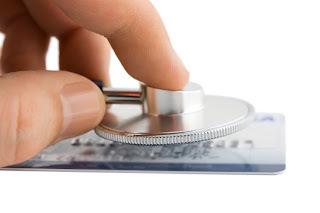 The bank can incorporate alternative data more quickly and use across all product lines. Furthermore, the bank was able to further simplify their four decisioning / rules processing by consolidating into a single solution. The result for this bank is they have reduced complexity and risk, lowered their support and maintenance costs, can propagate change much more efficiently, and have more transparency for reporting and compliance purposes. 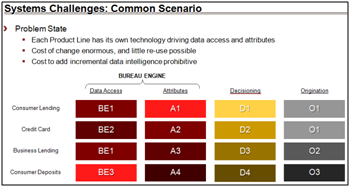 And as part of this transformation, business users can now drive much of the attribute creation process through a business user interface, bypassing key obstacles in their IT organization and improving overall quality. As a result, this bank is in a stronger position to support growth moving forward. Equifax is helping banks simplify their application footprint by creating consolidated solutions for authentication, data access and integration, scoring and analytics, and risk decisioning and exception management. Simplification helps reduce support costs, normalize best practices, increase the ability to respond to market changes, ease the burden of compliance and reporting, and enhance the user experience for customers. Want to learn more? Send us an e-mail. Stay in touch by signing up for our monthly newsletter or follow us on twitter. This post was contributed by: Lee Grice. Click here to subscribe to our blog posts.